Kim attributes her professional success to being raised in an incredibly supportive family. 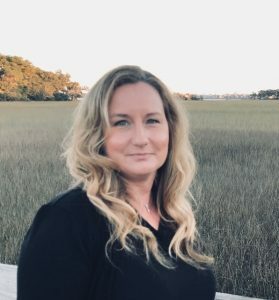 She grew up in several Midwest states including Kansas, Ohio, and Arizona, but made Charleston her home in 1993, shortly after graduating from Kansas State University. Kim’s Real Estate career began in 1997 when she decided to leave apparel management and marketing for a new-found passion to help clients find the right home or real estate investment. Kim learned all the basics of real estate including working with first time home buyers, all aspects of building a new home, the best way to market a home in both a good and bad economy and especially listening to and understanding her clients’ needs. She was recognized as the Top Producer for a local brokerage firm from 2012-2015 and was also awarded “Elite” status from 2011-2015 for performing in the top 1 % of all agents nationwide in her national franchise. Over the past 20 years, Kim has become aware that her clients all have different real estate needs and goals. There is no “normal” when it comes to real estate. Every purchase a buyer or seller is involved with is different and personal to them. Therefore, there is always different advice for each individual client. Kim’s client base is made up of long-lasting associations that often consists of not only multiple transactions, but also referring her to close family and friends. Kim is truly excited to be part of the Brennaman Group of Mt. Pleasant where she is currently assisting Buyer’s and Seller’s achieve their goals by listening and tailoring solutions that perfectly meet their specific need. Kim’s passion for her career is what has led her to excel in Real Estate. As someone who loves living in Charleston, she enjoys sharing the many Real Estate opportunities the city has to offer her clients. She feels it is imperative to her success to maintain her Real Estate education to stay current with ever-changing trends and to best serve her clients’ needs. Every buyer and seller have a different personal situation and Kim truly enjoys learning about her clients and helping them achieve their goals. She has also learned by experience in her own personal real estate transactions in numerous ways over years to know what it feels like to “be you” in the transactions. She finds nothing more rewarding and complimentary than when her clients are satisfied and refer her to their friends or family. Kim has built several of her own homes locally and partnered with her parents in owning and selling rental properties. In her personal time, she focuses on spending time with her husband James and two stepchildren Brendan and Amber. As a family they love to be outdoors at the beach, dirt biking at local trails, or spending a weekend out of town exploring nearby cities. The family also includes their two dogs Lucy and Lexi, whom may be seen at area dog parks, the farmer’s market and pet-friendly eateries.